Northern Irishman Johnny McKinstry has been sacked as coach of Sierra Leone, six months after he was given the job on a permanent basis. His dismissal comes after defeats by Ivory Coast and DR Congo in the 2015 Africa Cup of Nations qualifiers earlier this month. The results leave them bottom of Group D of the Nations Cup qualifiers without a single point so far. Acting director of sports at the Sierra Leone sports ministry, Saidu Mansaray, told BBC Sport that McKinstry has been fired because of the poor results. He added the decision was taken jointly by the ministry and the country's football association. The 29-year-old was first appointed as caretaker coach of Leone Stars in April last year during the qualifiers for the 2014 World Cup, following the resignation of Swede Lars Olof Mattson. 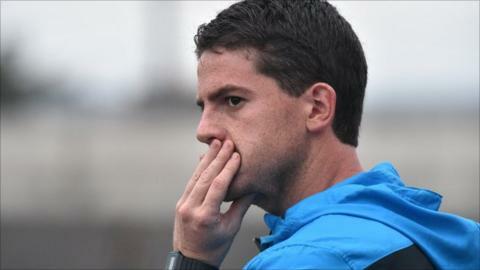 McKinstry has expressed his sadness over the sacking. "I'm very disappointed because we were moving in the right direction," he told BBC Sport. "We were developing a team over the last 17 months and the future was bright." "Poor preparation is the significant factor why we lost to both Ivory Coast and DR Congo. We had no time to prepare mainly due to long periods of travelling. "I'm sure if had I continued as coach of the team we would have improved." Sierra Leone's preparations for their opening Nations Cup qualifiers were hit by the outbreak of the deadly Ebola virus in the country, which led the Confederation of African Football to rule they could not host their home qualifiers. After Ghana turned down Sierra Leone's request to play there, the Leone Stars were eventually forced to play their "home" tie against DR Congo in the Congolese city of Lubumbashi and they lost 2-0. That defeat came hot on the heels of a 2-1 loss to Ivory Coast, whose government gave the go-ahead for the match to be playedSierra Leone to play in Abidjan only four days prior, also because of fears over the spread of Ebola. In between the ties, Leone Stars had endured a trip of almost 48 hours to travel between venues, contributing to their difficulties. McKinstry will continue to manage the Craig Bellamy Football academy on the outskirts of Freetown. Local media are tipping Ghana-born former Sierra Leone international Atto Mensah, who is currently based in the Netherlands, to be named as his replacement.